Overall, Diamond Naturals Indoor Cat is a below average cat food, earning 5 out of a possible 10 paws based on its nutritional analysis and ingredient list. 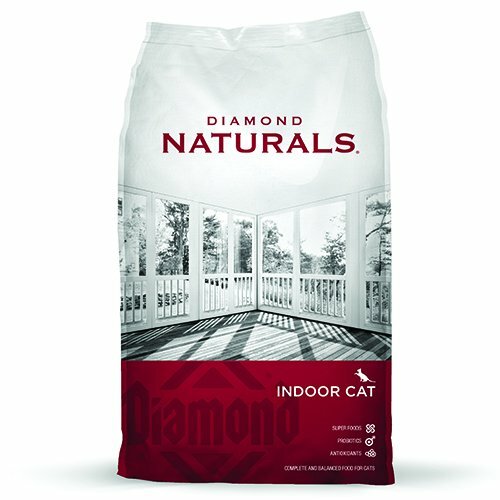 In this case, Diamond Naturals Indoor Cat's most plentiful ingredient listed is chicken meal, which is considered a quality protein source. It also contains chicken as additional quality protein sources. Additionally, Diamond Naturals Indoor Cat also contains as top ingredients ground white rice. These types of ingredients are typically used as bulk-adding fillers and are not required in your cat's diet. However, they are sometimes used to help maintain the kibble shape in dry foods. Allergen alert: This product contains fish meal which may be problematic for cats who suffer from seafood food allergies. Using the calculations provided by the AAFCO, Diamond Naturals Indoor Cat has approximately 357 calories per 100g (101 calories/ounce), which is fewer calories compared to the average of the other dry cat foods in the CatFoodDB. All the product information on this page is based on data collected from the manufacturer's product website as retrieved on May 25, 2016. Chicken meal, chicken, peas, ground white rice, cracked pearled barley, powdered cellulose, chicken fat (preserved with mixed tocopherols), natural flavor, fish meal, flaxseed, sodium bisulfate, choline chloride, DL-methionine, taurine, dried chicory root, L-Carnitine, kale, chia seed, pumpkin, blueberries, oranges, quinoa, dried kelp, coconut, spinach, carrots, papaya, yucca schidigera extract, dried Lactobacillus acidophilus fermentation product, dried Bifidobacterium animalis fermentation product, zinc proteinate, vitamin E supplement, niacin, manganese proteinate, copper proteinate, zinc sulfate, manganese sulfate, copper sulfate, thiamine mononitrate (vitamin B1), vitamin A supplement, biotin, potassium iodide, calcium pantothenate, riboflavin (vitamin B2), pyridoxine hydrochloride (vitamin B6), vitamin B12 supplement, manganous oxide, sodium selenite, vitamin D supplement, folic acid.